Each chapter in this Part 3 contains a burden of intercession for a particular people group in which I was honored to participate. The first two chapters are for my hometown city. The next two chapters are for my state of Alabama. The following two chapters contain intercession for my nation of America. And the final two chapters contain a burden for the nations (chapter 21 is prayer for Africa and Israel, and chapter 22 is intercession to see the spotless Bride Body of Christ come forth, which is made up from all the nations of the earth). The principles of intercession involved in the following chapters can be applied to any city or region. Living a life of intercession is a major part of being a mature son of God. Jesus "ever lives to make intercession" (Heb. 7:25) and so do His mature sons. It is a lifestyle, not just a theory, of hearing and obeying God as a first priority in all areas of life. The purpose of this writing is to map out the spiritual history of Huntsville Alabama so that my city can better pray with understanding the Lord's purposes for our region today. When we understand the unique destiny to which God has called us as a city it will help us to unify as the ONE Body of Christ while looking to Jesus as our Head for step by step instructions towards citywide revival. Throughout the Scriptures the Lord often addresses cities. In the book of Revelation, He addresses seven churches by geographical location and not by certain giftings or denominations. Each of these seven cities had a different calling and purpose to fulfill in Christ, which is why they were each given a different word of exhortation. Likewise, God has a special plan for Huntsville and it would only be wise to look back at our spiritual heritage and honor what He has already done in our region in order to help us project what God may do in the future. 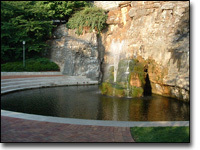 Huntsville was founded around "The Big Spring" which is an inexhaustible source of pure water flowing out from a huge rock cliff face. In history, this natural spring was a marvel to both Indian and frontiersman alike, and it is now home to the main central park in downtown Huntsville called "Big Spring Park." John Hunt, from whom the name Huntsville was first derived, was one of the first settlers in the area and built a cabin right next to this big spring in 1805. This spring was the main source of fresh water for Huntsville's citizens. For 30 years prior to 1950, revenue from the sale of this spring water was the largest single source of income for the city's general fund. There is a Huntsville historical marker at this site which reads, "A park/picnic ground was developed around the spring in 1898. Before that and for many years afterward, great crowds attended religious baptisms held below the small dam at the spring." So we can see that from the very central point of our city there is a testimony of faith in Jesus Christ through baptisms being performed at The Big Spring, and an official Huntsville Historical Society signpost to declare it. Water in Scripture is often compared to the Word of God. Ephesians 5:26 says, that Christ sanctifies and cleanses His Bride "with the washing of water by the word." So part of God's purpose for our city has to do with declaring the Word of the Lord which is living and active like a flowing spring (not a stagnant pond). John saw "a pure river of water of life, clear as crystal, proceeding from the throne of God and of the Lamb" (Rev. 22:1). Ezekiel saw the temple that will be built during the millennial reign of Christ and "there was water flowing from under the threshold of the temple toward the east." This water flowed to become a very deep river reaching the Dead Sea and healing the waters. Likewise, the Big Spring in Huntsville flows all the way to the Tennessee River. Finally, this large rock cliff at Big Spring Park is reminiscent of the rock at Meribah which Moses spoke to and brought forth water for the children of Israel to drink in the desert (Ex. 17:5-7). God compares Himself to, "the fountain of living waters," in Jeremiah 2:13, and Jesus said in John 7:37 that, "If anyone thirsts, let him come to Me and drink. He who believes in Me, as the scripture has said, out of his heart will flow rivers of living water." My desire for Huntsville is the same as Martin Luther King's desire for our nation when he quoted from Amos 5:24 saying, "Let justice flow like a river, and righteousness like an ever-flowing stream!" The biggest landmark downtown is probably the Von Braun Civic Center named after the famous rocket scientist Dr. Werner Von Braun who came to Huntsville in 1950 to pioneer what is now the United States Space Program. This civic center houses all of the city's major conventions, concerts and sporting events (except for the Huntsville Stars baseball team which has their own stadium). But the most interesting piece of history about the VBC is that it stands on the very property that was owned by the first educational facility for African-Americans in the region, now known as Alabama A&M University. In 1873, legislature approved "a normal school for the education of colored teachers" and ex-slave William Hooper Councill was the founder and first president. A Huntsville Historical Society marker located at the VBC states that in 1891 land grants allowed A&M University to move to their present campus north of the city because of their increased growth for training in agricultural and mechanic arts. Huntsville has always had a strong stand for civil rights. In the 1960's, Huntsville was the first city to override Governor Wallace's attempts at segregation when we allowed Black students freedom to enter our schools. When Alabama Governor George Wallace stood in a schoolhouse door in Tuscaloosa to prevent Blacks from entering the University of Alabama, a Black engineer named Dave McGlathery quietly enrolled at the University of Alabama in Huntsville the next day. This openness to education for all races in Huntsville has allowed a variety of local groups to maintain archives of documents and artifacts on African American history and culture. An entire section of the Huntsville.org web-page is dedicated to these groups which include: the Alabama State Black Archives Research Center and Museum, Oakwood Archives and Museum, and Imhotep Art Gallery just to name a few. Oakwood college was the Nation's first and only Black Seventh-Day Adventist college founded in 1896 in Huntsville. A man by the name of Dred Scott (original name Sam Blow) used to be a slave on the property that is now owned by Oakwood college. Scott's story of slavery to freedom received the attention of the nation as he began a 10 year quest for freedom starting on April 6, 1846. Huntsville was a place where Scott was able to shake the nation's legal system until he was declared a free man in 1857. The Huntsville Visitors bureau web-site says: "On the Oakwood campus a plot of ground almost 100 feet square bounded by four granite stones marks a sacred spot on the campus where 40 to 50 slaves were buried. It is believed that descendants of Dred Scott were buried there. The last record of slaves living on this land was in the year 1821." How wonderful it is to see that Oakwood college territory was transformed from a place of slavery into a declaration of freedom! And now the gospel of Jesus Christ is taught from this plot of land every day. "The Rev. William Harris organized the Huntsville African Baptist Church in the late 1820's; it is one of the oldest independent churches in Alabama. The church was burned during the war; but after the war, President Ulysses Grant appropriated money to rebuild the church in a nearby location which was dedicated in 1872. At that time, the name was changed from Huntsville African Baptist Church to Saint Bartley Primitive Baptist Church in respect for their pastor Bartley Harris who was said to have baptized some 3,000 people in his lifetime. The history of Saint Bartley Church is closely related to the "Big Spring Baptism" events that occurred annually beginning in the 1800's." This quote from the www.Huntsville.org website shows that African-Americans have held a large role in the spiritual map of Huntsville. We can expect that any future citywide revival will include this sector of the community, and may very well start out from the African American community. There is a red bridge in Big Spring Park that was donated by the Japanese Defense forces to honor the American bicentennial in 1776 and give thanks for Huntsville's help in their Missile Programs. I think it shows a great deal of reconciliation and goodwill for America and Huntsville to help a nation such as Japan with their missile programs when we were at war with them only 30 years earlier! Another monument that stands out rather boldly in Big Spring Park is the large rock with a bronze replica of the Declaration of Independence signed in Congress on July 4th 1776. This is located in what is called "Freedom Plaza." Above this rock, and above the complete wording of the Unanimous Declaration of the 13 United States of America, is a large torch that contains real fire that stays burning all the time from a gas line. What an awesome statement about freedom to declare from the center of town! How characteristic of Huntsville whose history is so full of examples of men and women standing for unity amongst diversity and against oppression and tyranny. There were many wealthy businessmen in Huntsville who remained loyal to the Union during the Civil War, which is why the town was spared the destruction by occupying armies. Once again showing that Huntsville has been wise in knowing when to rebel against tyranny and oppression (i.e. this declaration of independence replica, and the civil rights support), yet we have also been wise enough to know when to stand for union during a time of national strife. This reminds me of Phinehas who was a man in the Scriptures that was given a Covenant of Peace because he was zealous for God and judged oppression and tyranny ruthlessly. But, Phinehas had a discerning heart not to judge by outward appearances and was able to get to the heart of a matter so as not to create unneeded harm. The details on Phinehas were discussed in chapter 5 of this book. 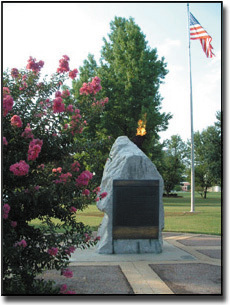 The Eternal Flame torch is reminiscent of Huntsville's calling to be a "Lampstand" of the Spirit of Knowledge, which will also be discussed in the next chapter. There are seven spirits that burn before the throne of God (Rev. 1:12), and Isaiah 11:2 spells out each of these seven spirits as: 1) the Spirit of the Lord (love) 2) the Spirit of Wisdom (truth) 3) the Spirit of Understanding (revelation) 4) the Spirit of Counsel (remembrance/restoration) 5) The Spirit of Might (power) 6) the Spirit of Knowledge (publishing), and 7) the Spirit of the Fear of the Lord (grace). This Spirit of Knowledge is the spirit the scribes in the Bible were anointed with to publish the knowledge and truth of God's Word. The Spirit of Knowledge entails much more than just writing, but also DECLARING the Word of the Lord. 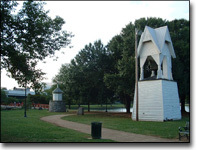 Two other historical landmarks that are found in Big Spring Park include a Norwegian Light Beacon and a Fog Bell that were given to Huntsville by Norway in 1973. The ancient Light beacon was one of the old oil burning type lights that served as a guiding light in the Marina. The fog bell was used to warn slower sailing ships in the fog. I think many obvious parallels could be drawn between these landmarks and the calling of Huntsville to be a Lampstand or a light set on a hill like Jesus told us in Matthew 5:14-16: "You are the light of the world. A city that is set on a hill cannot be hidden. Nor do they light a lamp and put it under a basket, but on a lampstand, and it gives light to all who are in the house. Let your light so shine before men, that they may see your good works and glorify your Father in heaven." The declarations that are made from the central point of a city are very important to the spiritual mapping of a region. It is very refreshing to see that the declarations being made from the birthplace of our city make room for the doors of heaven to open on behalf of the residents in Madison County. It is our privilege, as intercessors, to come into agreement with these decrees that have been put in place by our city's spiritual fathers and mothers. Their labor in the Lord was not in vain, and it has prepared the way for much of what God will do in Huntsville's future. Let's agree with the great cloud of witnesses in heaven for revival and revolution to begin in our community of Huntsville!